Once the inevitable pizzas were dealt with, we settled down to the “Feature Game”. This was Cities of Splendor, the expansion to Splendor, a splendid little game that we’ve played quite a lot since its release in 2014. The base game is really quite simple, but although a lot of groups apparently find it very dull, our group seem to find quite a lot of mileage in its subtlety and trying to get the better of Burgundy who mostly seems pretty unbeatable. According to the rulebook, players are Renaissance merchants trying to buy gem mines, transportation methods and artisans in order to acquire the most prestige points. The most wealthy merchants might even receive a visit from a noble, which will further increase their prestige. Despite all this, the game itself is, in truth, really quite abstract. Players have essentially have three options on their turn: they can pick up gem tokens; buy a development card, or reserve a development card (and take a Gold token). When picking up tokens, the active player can either take three different gems, or, as long as there are four or more available, two the same, with a hand-limit of ten. These are then used to buy development cards which provide the player with a permanent supply of gems of a given colour and sometimes, some prestige points. The development cards come in three decks, and the Level Three cards as significantly more difficult to obtain, often requiring many gems. Sometimes it can be a good idea to reserve a particular card, preventing another player from taking it and getting a Gold token in return, which can be used in place of any gemstone when buying a development card. At the start of the game there is a small number of noble tiles each with with a requirement (e.g. four opals and four rubies); the first player to fulfil this requirement gets the noble and the associated number of prestige points. The first player to fifteen prestige points is the winner. We only had one copy of the expansion, but with several copies of the base game we decided to split into two groups, each playing different modules. The groups were split along the lines of who wanted to get beaten by Burgundy and who didn’t. The first group to get going contained Black and Blue, who were optimistic that the changes introduced by the expansion might upset Burgundy just enough to give someone else a chance to win. As they don’t normally get the chance to play with them, they started with nobles drawn at random from the 2016 and 2017 Brettspiel Advent calendars and the promotional set and then had to decide which expansion module to use. Rather than opting for the “Get Burgundy” module, they decided it would be fairer to choose something else and opted for the Trading Posts module. This provides an additional small board with five “Posts” with specific requirements, which if fulfilled give players extra options. For example, a player with one diamond and three ruby development cards is allowed to collect a single token every time they buy a development card. 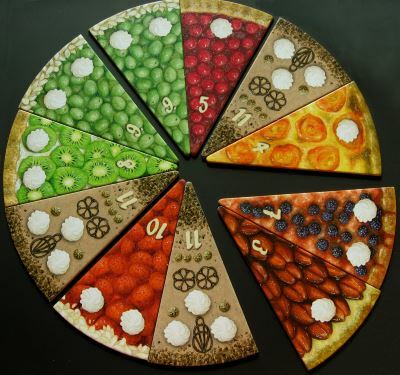 Although Splendor is normally quite a thoughtful game, it usually moves along quite quickly. However, the addition of the expansion, slowed the normal fast pace quite noticeably as everyone spent more time working through the options for each turn, especially at the start. It wasn’t unpleasantly slow though, particularly as everyone had plenty to think about during the down time. Burgundy grabbed lots of diamonds and quickly began to claim some of the special powers available from the Trading Posts, making particularly good use of the first one which allowed him to collect a token every time he picked up a development card. Black tried to go for the last two Trading posts, one of which gave him two a point for each other Trading Post he had claimed and another which gave him a straight five points. Blue had started well, but was finding that all the diamond cards had evaporated which brought her game to an abrupt halt. It wasn’t long before Burgundy was picking up his second noble, and with Black two turns away from finishing the game himself, the game came to an end as Burgundy claimed his fifteenth point, six more than anyone else. Meanwhile, on the neighbouring table, they were playing with The Orient Module. This provides ten extra development cards at each of the three levels, a total of six of which are placed face up (two from each level). These red-backed, “Orient” cards have interesting and unusual powers. For example, there is a level one card which acts as a single use, pair of gold tokens which can be used at any time during the game. The other card available from the level one deck is an “Association” card which is immediately associated with one other card and increases the yield of that card by one. There are also some double gem cards and one that enables players to reserve a noble. Everyone made good use of the double gold cards and the “money bag” Association cards (aka “onion” cards) in the first row of Orient cards. The second row expansion cards remained in place for quite some time. Purple took a lot of development cards using gold tokens, Green plodded away with opal and sapphire development cards, while Red was trying to hold on to her double gold cards to use on those difficult to get top row cards. Eventually Green claimed a level two Orient card, a double red gem, which got him to within a whisker of getting the first noble, but Red had other plans. An Orient card swiftly enabled her to reserve the noble, take from under Green’s nose and thus preventing him from taking a commanding lead. Before long, Green was back, however, having built up his opals and diamonds which enabled him to claim Isabelle of Castile (with four opals and four diamonds). Then it was only a matter of time, Red claimed her noble, but couldn’t stop Green taking a top row card to finish the game with sixteen points leaving Purple, who had started, very frustrated—she was just one turn from claiming her reserved card which would have given her the last noble and fifteen points. Red had really enjoyed the extra challenge and had felt that the higher level expansion cards hadn’t really come into play and fancied giving it another go. So, unusually for the group, rather than packing up, it got a second game. There was a brief debate whether going first in Splendor is an advantage or not and the discussion spread to the next table. It seems to be perceived wisdom, but there was a debate about whether the fact that players at the end of the round can get an extra turn (and so play for more points) might offset that. Ultimately, no-one felt it made much of a difference and since Purple had started last time, it was between Green and Red, so they played Rock-Paper-Scissors to decide. With the excitement building, the count began, 1, 2, 3! Round One was a draw: both had paper. With the tension so tight you could cut it with blunt knife they started across the table at each other and prepared for the second round; a switch from paper was likely, but which way: Green went Scissors, but Red took the game with a well timed Rock and started the second game of Splendor. Playing for a second time did not change the amount of thought that went into each turn; it always felt like a conundrum, one where several moves looked like good ones. 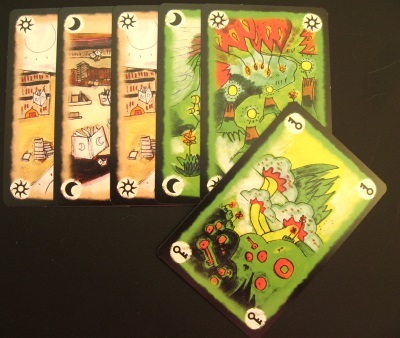 Perhaps the Orient cards hadn’t been shuffled very well, but all the level one “Onion” Association cards came out first and the double gold cards seemed to be stuck at the bottom of the pile. Red claimed to not know what she was doing, but made efficient use of her “Onions” nonetheless. Purple continued her gold token strategy making sure she took whatever looked useful to Green while Green ironically, just couldn’t get any green emerald cards. In fact the emerald development card handicap became quite a problem, especially since the other two were holding on to their green tokens and while an “Onion” card might have helped, he still needed one emerald card to start with! Eventually, Green was forced to change his strategy and picked up a level two expansion card to reserve the noble he was after before someone else had the chance to pinch it—all the more critical since it was the only one he could get under the circumstances. Red took the lead when she gained her first noble, but she said it wouldn’t last long, and she was right. Purple was next and was able to reserve a noble for herself, then Green claimed his reserved noble. The game continued to be quite tight and even though Green managed to claim a second noble, it wasn’t enough to end the game. That privilege fell to Red who finished with seventeen points. Purple was left with nothing she could do to increase her score, but that led to a debate as to what Green might be able to do. With twelve points, green needed five to draw level with Red and there was a five point card he could claim on the table. However, if Purple took that he would then only be able to claim a three point card, unless the card purple took was replaced with another five point development he could claim. Purple decided to play king-maker and took the card leaving an unhelpful replacement card leaving him two points behind Red, the winner. Since Red, Green and Purple had gone onto a second game, Blue and Black decided to do likewise and have another pop at Burgundy. This time, Blue went on the offensive and decided that black opals were essential to her game plan and a couple of rounds in, suddenly realised that she had almost all the black tokens and there were no attainable opal development cards available. With the others in dire straights, Blue was able to completely strangle the game. The problem with this strategy is that holding all the tokens of one colour is a very powerful position to be in, but that power is useless unless those tokens are spent and then the power is gone. Additionally, the other players will inevitably build up their cards in other colours and eventually this will lead to accessible cards for the rare gem turning up. So, timing is critical and there is a lot of luck involved as well. Perhaps the key part is to ensure that the amount of effort put in to controlling the game doesn’t exceed the value obtained. Inevitably, Blue didn’t have the perfect timing required and eventually Burgundy broke free, finishing the game with a massive twenty points, leaving the others standing. The fact that both tables wanted to give their module another go says a lot about what we thought of them. Clearly, the changes to the rules were not enormous but added a nice little bit of variation to a game we’ve played and enjoyed a lot. Inevitably, we felt some of the Trading Posts some seemed much more powerful than others. For example, the second Post enabled a player to take an extra gem of a different colour when taking two gems of the same colour. The problem with this is that taking two tokens of the same colour is only possible if there are at least four tokens available in that colour. In the two and three player games this is relatively unusual until later on when players have a lot of cards and no-longer need tokens, by which time it is too late. In the four player game, we felt this would become much more valuable though. On the other table, the players still felt they had been unable to use the high value Orient cards, even after a second attempt. This led to a lot of discussion, in particular whether raising end-game trigger from fifteen to twenty, might encourage their use. Certainly it could be an interesting variant to try on another occasion, either way, Cities of Splendor is certainly going see the table again for lots of reasons: it has breathed new life into the old game, we have two the other two modules to try, and Burgundy went straight out and bought a copy as well! While Burgundy was finishing beating Black and Blue black and blue, the other group were looking for something to play. Red had started the evening relating her failed attempts to acquire Kingdomino for less than a fiver. She had been keen to get hold of it even though she had not played it, so this seemed an opportune moment for Red to be properly introduced to the game. It’s such a simple game that the rules explanation was quickly done: Players take a domino which they add to their kingdom and then place their meeple on one of the dominoes on display for the next round. There are a couple of really clever bits to this game though. Firstly, since the dominos have a numerical value and are set out and taken, from low to high, players going for the more valuable tiles are trading this value against their position in the turn order. 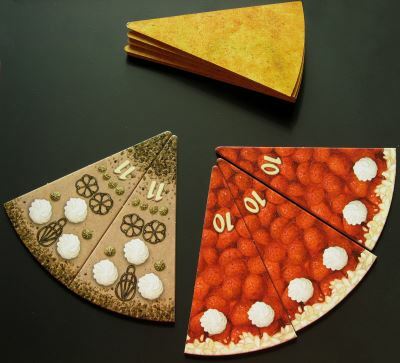 Secondly, the two ends of the dominos depict terrain and when placed one end must connect to terrain of the same type already in the kingdom (or connect directly to the start tile). Since all dominoes must fit in a five-by-five space (or be discarded) keeping options open is an essential part of the game. Finally, some tiles also depict one or more crowns, which are the key to scoring as each player multiplies the number of tiles in each contiguous region of terrain with the number of crowns on the tiles in that region. This means that no matter how big an area is, it is worthless without any crowns. Although it is a simple little game, it is easy to make a fatal mistake, and that’s exactly what happened this time. Somehow, Purple messed up her grid patterns, but worse was to come. She had been targetting mountains and pastures, while both Red and Green were looking to forests and lakes to fill their kingdoms. With only three playing a dozen dominoes were removed and it was not until the end of the game (face down). It was only at the end of the game that it became apparent why Red and Green had found it so much easier to fulfil their plans—the high scoring mines and lots of pasture (including three of the crown tiles) had been removed. The odds had been heavily stacked against Purple this time. With the others both getting a full set of bonus points, it was very close between first and second despite the fact that Green had played the game several times. In the end there was only two points in it, with Green the narrow victor. On the other table, Cities of Splendor had finished and the group were looking for something to play. Inspired by the nearby game of Kingdomino, Black spotted Queendomino which he had not yet played. Blue commented that she was happy to play it and be proven wrong, but that she felt it took all the good things in a great little game and broke it. In her mind, the comparison was similar to that of Tsuro and Tsuro of the Seas. The former is a short, light game that plays lots of people and despite player elimination is still great fun with minimal downtime. On the other hand, playing Tsuro of the Seas at the Didcot Games Club had, on one notable occasion, ended up with Burgundy getting knocked out a couple of turns in and spending the next hour and a half as a spectator. In Blue’s eyes, Queendomino’s first offence was the fact that instead of the tidy little box that Kingdomino came in, it had a huge, Ticket to Ride sized box, mostly because there was a tile-tower included. This offended her sense of efficiency, but wouldn’t have been so bad, if it had worked properly. Although the magnetic closing mechanism was cool, Blue in particular had repeated difficulties getting the tiles out of the bottom, a problem that was exacerbated as the stack got smaller and the reduced mass pressed less on the tile being drawn out, making it increasingly difficult. As for the game, the basic mechanism is the same as Kingdomino, however, there is an extra tile type: red building plots. These act exactly the same as the other terrain types, except that there are a number of building tiles on display that payers can buy and add to their kingdom. This building display is only refilled at the end of the round which can make being late in the turn order more of a problem. This can be compounded if someone chooses to bribe the dragon to burn down one of the buildings. Amongst other things, these buildings provide knights and turrets that players can use to collect taxes and score more points. While this has the potential to make the game deeper, the downside is that it can make the already slightly mathsy scoring even worse. Despite all this and Blue’s really rather appalling rules explanation, everyone was surprisingly keen to give it a go. Burgundy inevitably, tried to profit from the new components and eagerly started collecting wooden turrets. Blue and Black were a little more circumspect, though both of them picked up a few knights and used them to good effect to collect enough in taxes to ensure they were able to build a couple of nice buildings. In the end, it surprisingly close, and after several re-counts, Black was deemed the winner, six points ahead of Burgundy in second place. Looking at the scores, it turned out that both Black and Blue had made most of their points on the original terrain, and it was arguable how much the new buildings had really helped. Burgundy’s entire game plan had revolved around the new buildings, but somehow, although it looked like he was running away with it, the game hadn’t quite panned out like that. Blue asked what the others thought of it and Burgundy commented that he’d be happy to give it another go, but that was in complete contrast to Black, who’s one word answer, summed up Blue’s feelings, “Terrible”. At some point point during the game, Red had asked whether Blue would feel better about the game if it didn’t have the tower, to which Blue replied that it wasn’t the tower per se, it was more that the tower was a metaphor for all all the stuff they had added to the original Kingdomino game: it was nice to look at, but fiddly, totally un-necessary and overall made the whole experience much less enjoyable. With that, she had removed the tiles from the tower and immediately felt better about the whole thing, but not enough to save the game from being sold at the earliest opportunity. So, Burgundy might not get his second chance to play it after all. Meanwhile on the next table, everyone was feeling a little tired, but as the hugely complex game of Queendomino, was still going on, Red and Green decided not to leave Purple relegated to observer, and chose to play one more short game. The game in question was Battle Kittens, primarily because it’s got kittens in it, but also because it’s quite quick. This was a game Blue picked up on a trip to Reading with Green, and, as he had enjoyed it more than she had, he’d received it as a little gift at the GOATS New Year Party. 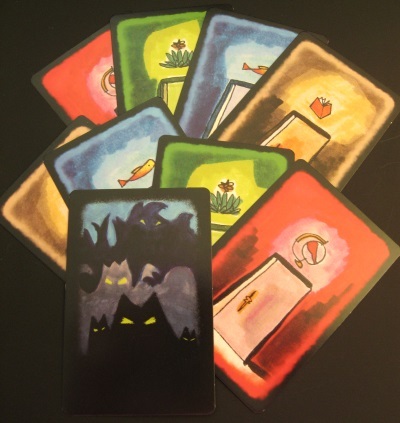 At it’s core, it is a card drafting game where players draft their hand of kitten cards and then send them off to battle. Each of the three arenas will contest three of the four kittenny attributes: agility, strength, wisdom and cuteness. Players decide which kittens they want to put into each arena and then resolve any special cards with the highest total running out the winner. At various times, both Purple and Red had a victory cruelly snatched away from them to the benefit of Green. The first time this happened was to Red who had a high score with three kittens and had it ended there she would have won that battle. Unfortunately, she was forced to take a King card first, and lost all her other kittens and ended up losing the battle. Similarly, in the second round, Purple managed to get some really good Crown cards and won a couple of battles quite convincingly, but they either gave more fish for coming second or gave an equal number for first and second place and thus did nothing to dent Green’s growing pile of fish as his kittens gambolled their way to victory. Learning Outcome: Some expansions really add to the game, others can take a great game and make it “terrible”. This entry was posted in Games Night and tagged Battle Kittens, Between Two Cities, Between Two Cities: Capitals, Cities of Splendor, Queendomino, Rock-Paper-Scissors, Splendor, Splendor – Brettspiel Adventskalender Promo Tile, Splendor: Nobles Promo Tiles, Splendor: Special Noble Patron, Tsuro, Tsuro of the Seas on February 5, 2018 by nannyGOAT. As we meet at The Jockey every week, last year at Christmas we decided to enter a team for their Quiz night between Christmas and New Year. We didn’t have a large team, but Blue, Pink, Pine, Violet and Violet’s mum were in attendance and had managed to win for the GOATS at the first attempt. Flushed with that success, we decided to give it a go this year too. This time there were seven of us with Pine bringing along his mate, Azure. As before, we booked a table for 8pm and, as usual, pizza was largely the order of the day with a burger, tagliatelle and scampi for those who decided not to follow the tradition. While we were waiting for food to arrive, Green asked whether Red was going to be about over Christmas as he had some Gruyère for her. Unfortunately Azure misheard and asked who Trevor was. Much hilarity ensued as Pine got himself in a terrible mess explaining who Red was and why he thought she wouldn’t be interested in someone called Trevor, but would love a block of cave-aged cheese! To spare his further blushes, someone quickly suggested we played a game, which seemed like a good idea. With so many people and so little time, the choice was limited, so we went with Tsuro. Tsuro is a very simple game to teach and play, and, although it has nasties such as player elimination, it is so quick to play that these things don’t really matter. 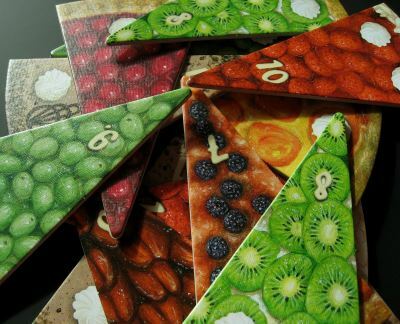 The idea is that each player has a “Stone” which starts on a marker at the edge of the board and a hand of three tiles. On their turn, the active player then places a tile on the next square in such a way as to create a path in front of the stone. They then move their stone (and any others affected) along the path to the new end. The game continues with players taking turns to place tiles and move stones trying to keep their stone on the board and avoid colliding with any other stone; the last stone left is the winner. This time, it was a cagey start as everyone was very careful. It wasn’t until the draw deck had been depleted, that the first players were eliminated, with Pine forced to play a tile that caused him to collide with Blue removing both from the game. Purple and Azure were next leaving three players until Black was forced to take himself off the board and Green with him, leaving Pink the sole survivor. We started off badly, but quickly improved with a perfect score in the second round. We maintained steady progress, but the team that beat the “Eggheads” would take some catching. As the Quiz progressed it was clear that we would need a really good score in the “Who Am I?”, anagram and picture rounds to be in with a chance. We got all three anagrams, but the “Who Am I?” was a bit of a disaster as we worked out who it was (“the big bloke from The Chase“), but couldn’t remember his name. It turned out that that was actually enough information, but we only found that at the very end, so only got one point (his name is Mark Labbett). Although we put in a reasonable picture round, it wasn’t good enough to make up the difference and we finished in a respectable second place. With the Quiz over, we reverted to what we do best and went back to playing board games, or in this case, a dice game, as we finished the evening with Las Vegas. The game itself is a very simple betting game. Players begin their turn by rolling their dice and then assign some of them to one of six casinos (one for each dice face) each of which has a jackpot drawn at random from a deck of money. Players must place all the dice displaying one number to bet on the casino of that number, and when done, play passes to the next player. Once everyone has placed all their dice the player who placed the most dice on a casino takes the highest value currency card, with the person in second place taking the next and so on. The really clever bit is that before any money is handed out, any “draws” are removed. This leads to a lot of barracking when dice are played as opponents try to encourage the active player to choose their favoured option. As usual, we included the Big Dice from the Boulevard expansion and the Slot Machine mini-expansion from the 2015 Brettspiel Advent Calendar. The large dice are double weight and count as two in the final reckoning. The Slot Machine acts like a seventh casino, except that it can hold dice of any number, but dice of each number can only be added once (though a player must add all the dice they have of that number). Since we play the game unusually slowly, we generally stop after just three rounds rather than the four recommended in the rules, and today was no exception. Reducing the number of rounds meant that everyone had to make each round count to stay in the running, especially in such a close game. Three players took over $300,000, with Green just $10,000 ahead of Black. It was Blue who finished first, however, thanks largely to her judicious use of the slot machine which ensured a healthy return in the first two rounds. And with that, it was home time for everyone, including Trevor the Cheese. Learning Outcome: Shy bairns get nowt. This entry was posted in Games Night, Other Events and tagged 6 Nimmt!, Azul, El Grande, El Grande: Grand Inquisitor & the Colonies, Kingdomino, Las Vegas, Las Vegas Boulevard, Las Vegas: The Slot Machine, NMBR 9, Tsuro on January 8, 2018 by nannyGOAT. As people arrived, we began setting up the “Feature Game”. This, as has become traditional at these New Year events, was the gorgeous, dexterity car-racing game, PitchCar. Burgundy and Pink built a fantastic figure-of-eight track that made good use of the ⅛ turns from the second expansion and made a really fast compact circuit. Before long, Black and Purple had arrived and had introduced themselves to the furry host, followed by Grey and Cerise who were armed with Champagne and Polish delicacies. The game is quite simple, players take it in turns to flick their small wooden cars once, starting with the player at the front of the pack. If the car leaves the track or rolls over, the player forfeits stroke and distance (though any collateral gains by other players stand). We usually have a single solo lap to determine the order on the start grid and to allow new players to get their eye in, before racing two laps of the track. While Blue and Pink occupied themselves in the kitchen, everyone else began their practice run. Cerise went first and set a very competitive bench-mark of ten flicks mastering the bridge from the first expansion on her second attempt. Asked whether she’d played it before, she replied, not since she was tiny, playing with bottle-tops. It turned out that Grey had also had a similarly mis-spent childhood and this with his competitiveness made him a formidable opponent. Black and Burgundy gave them a run for their money, but Grey took the lead and held off the competition to take first place, with Cerise close behind, a worthy second. With pizza already over-cooked, everyone helped to quickly pack up and then sat down for dinner. Once everyone had eaten their fill, Pink began tidying while everyone else began the next game, Ca$h ‘n Guns. This game combines gambling with a little chance and a dash of strategy, based round the theme of gangsters divvying up their ill-gotten gains by playing a sort of multi-player Russian Roulette. For some reason, setting up degenerated into a discussion about the offensive weapons act and Tony Martin and the debate was still going by the time Pink had finished what he was doing, so he joined in. Black, (playing “The Hustler”), chose to enact his special power by trading a bullet card for one of Blue’s blanks, much to her delight. Then, Pink (playing “The Doctor”), started as the Godfather, so acted as caller. So, once everyone had “loaded” their weapon with blanks or bullets, on, the count of three, everyone pointed their foam gun at someone. Pink chose to invoke the Godfather’s Prerogative and decided Purple looked most threatening, so directed her to point her gun at Burgundy. The Godfather then counted to three to give everyone a reasonable chance to withdraw from “The Game”, but also relinquish their claim to a share of the loot for that round. Throughout, everyone was feeling quite brave, but it was Burgundy (“The Cute”) who had a particularly strong incentive to stay in, as his special power allowed him to take $5,000 before anyone else got a look in. It was a power he used to great effect taking an early obvious lead. Meanwhile, Blue (“The Vulture”) was the first to draw blood, defending her property against Grey (“The Greedy”). Like The Vulture she was, when Grey picked up a second wound, Blue finished him off and took two pictures from his still warm, lifeless hands. With, Burgundy clearly in the lead, Blue had help taking him down, and Pink got caught in the cross-fire. Picking the pockets of two corpses in the same round made her something of a target and in the next round she found the staring down all three remaining barrels which effectively put her out of the game. Purple (“The Collector”), began collecting diamonds, but, it was Cerise (“The Lucky Man”)’ who picked up the $60,000 for getting the most diamonds. As “The Collector”, Purple managed to score a staggering five pictures netting her $100,000 giving her a cool $156,000, $6,000 ahead of Black in second place, with Cerise a close third with $146,000. With seven of us, we’d normally split into two groups, but the party atmosphere had got to us a little, and with limited table space we were keen to stick together. With the majority of Blue and Pink’s not inconsiderable game collection at our disposal, we eschewed the usual go-to seven player game, Bohnanza, and decided to play play Between Two Cities. We played this a few weeks ago, but in essence, it is a draughting game, but one that has the depth of 7 Wonders, but with the simplicity of Sushi Go!. As before, we didn’t use any of the seating randomisers, but since we were all sat in different places and three players were new to it, this didn’t matter. Burgundy and Black began to build up a large number of factories and thought they were in with a chance of scoring heavily with them, but didn’t notice that Grey and Pink, had more, as did Blue and Pink. Blue and Black began with a complete row of shops, and followed it with extensive white collar employment opportunities, but were unable to expand the park as much as they wanted. Meanwhile, Grey and Cerise had developed a retail outlet centre with no fewer than seven shops and a number of conveniently situated houses and office blocks. Cerise’s other city, shared with Purple began as a paradise with parks and entertainments, until they added a factory to increase the value of their housing stock. Parks had been popular at the start of two other cities too, with Purple starting her other city the same way with Burgundy, and Blue and Pink doing something very similar. After three rounds we began the complicated matter of the scores. It was quite close, but Blue and Pink’s City was disproportionately ahead, a problem that was rectified with a quick recount that left two cities jointly leading on sixty. In the normal way, the winning city can only ever be important as a tie-breaker since it is the city with the fewer points that makes each players’ score. In this case, however, Pink owned both, with Blue and Grey. Since Blue’s other city (shared with Black) had fifty-nine points, that put her a close second. A quick interlude followed for non-alcoholic Champagne, alcoholic Prosecco, white chocolate, pistachio and Diaquiri fudge, with the chimes of Big Ben and fireworks. Once the New Year greetings were complete, it was onto the important matter of what to play next. Such a large number of players meant the choices were limited, so we went with a couple of old favourites. Tsuro was first, a quick fun game that we all know well and that featured on our list of ten great games to play with the family at Christmas. A game that anyone can play, in Tsuro each player has a “stone” dragon and on their turn places a tile in front of it and moves the dragon along the path. As the board becomes increasingly crowded, the tiles form a maze of paths that the stones must navigate, staying on the board without colliding with anyone else while trying to eliminate everyone else. Grey and Cerise were the first to go out by collision, followed by Burgundy who was ejected from the board by Purple. Black eliminated both Pink and Blue with one tile, before winning the game by dealing with the only remaining competitor, Purple. With that over, there was just time for another of our favourite games of 2015, 6 Nimmt!. For a reason none of us understand, this mixture of barely controlled chaos is strangely compelling, so it is a game we keep coming back to again and again. Despite the number of times we’ve played it as a group, somehow Grey had missed out, so we had a quick summary of the rules: players simultaneously choose a card, then starting with the lowest value card the players take it in turns to add their card to the four rows on the table in ascending order. The player who adds a sixth card, instead takes the first five cards to score and the sixth becomes the first card in the new row. As well as the face value of the cards, they also have a number of bulls’ heads (Nimmts) mostly one or two, but some as many as five or even seven. The aim is to minimise the number of Nimmts picked up, so things went horribly wrong from the start, with everyone picking up plenty in the first round, though it remained close aside from Purple who picked up nearly twice what anyone else took. The second round was made especially difficult by the fact that three of the four rows were effectively out of commission. Blue struggled with four cards with a value below ten as well as the highest card in the deck. Purple managed to exceed her score in the first round, giving her a near record- breaking fifty-one. Grey and Burgundy both managed a clean sheet in the second round, so it was Burgundy’s better score of just seven, that gave him the win. So with 2016 started in fine style, we decided it was time for bed. Learning outcome: Although seven is a difficult player count, there are some excellent games available when everyone is in the right mood. This entry was posted in Games Night and tagged 6 Nimmt!, 7 Wonders, Between Two Cities, Bohnanza, Ca$h 'n Guns, PitchCar, PitchCar Extension, PitchCar Extension 2: More Speed More Fun, Russian Roulette, Sushi Go!, Tsuro on January 7, 2016 by nannyGOAT.